A good beside gun safe is something that will help you to sleep more easily at night. Simply knowing that you can quickly and easily protect yourself in the case of a night-time emergency will give you a tremendous amount of peace of mind. Of course, there are a number of important points that you will want to bear in mind in order to make a smart choice when buying your new gun safe. By considering all of these issues before making a purchase you will stand a far better chance of buying the perfect safe to keep you feeling safe and secure. 1 What Makes a Good Bedside Gun Safe? What Makes a Good Bedside Gun Safe? There are a few crucial factors that anyone looking to get a bedside gun safe should take into account in order to make a good choice. The following are some of the main features to look out for. Easy access. You definitely want a safe that lets you open it quickly and without any hassle. 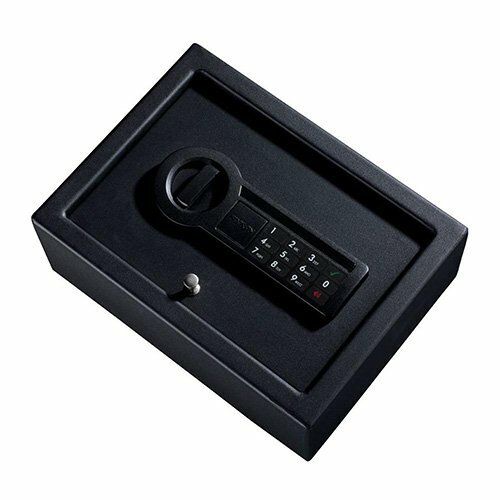 This is why biometric gun safes are a great choice for having close to your bed, while digital keypads also tend to be easy to use. The right size. The most common type of gun safe for use beside the bed is the small, compact type. This is because you probably only need to store a handgun in it and don’t want it taking up too much room. You might want to measure your available space before buying any model. Reliability. Above all, you need a safe that you can rely upon to open easily every single time. If you can’t get it to open when you most need it then it is something that you would be better off not having at all. An inner light. If you choose a gun safe that is easy to open then you won’t need to worry about switching on any lights before you open it. In this case, it makes perfect sense to choose one that has an inner light, to let you get hold of the gun quickly and safely. Noise or no noise? An issues that divides opinion is whether it is best to try and scare intruders off by making a noise when getting your gun out, or else surprise them by staying silent. Ideally, you will choose a bedside gun safe that gives you both options. Solid and sturdy. You will want to find a gun safe that is solid and sturdy enough to keep your firearms safe from the people who shouldn’t be touching them. A heavy steel safe will give you a terrific feeling of security. Of course, if you are going to keep a gun close to your bed then you also need to stay as safe as possible. The risk of something going wrong is simply too high to take any chances. The following steps are all essential if you are going to stay safe and keep everyone else in the house safe as well. Lock it at all times. There isn’t much point having a gun safe if you don’t keep it locked at all times. Stop unauthorized people from getting their hands on the gun by locking the door securely whenever the firearm is sitting inside it. Keep it ready to use. Fumbling with your safe door or hunting for keys isn’t an option when you and your family are in danger. You need the safe to be ready to open instantly and the gun inside ready to use in case of any sort of emergency. Know how to use the gun. Can you trust yourself to handle the gun well once you get it out of the safe in an emergency? Having a gun so close to you at night is a big responsibility and if you don’t know how to handle it then it could be more of a danger than a help. Show your family what to do. If there is a chance that you are going to get your gun out at night then what should your family members do? It is worth devising a drill that keeps everyone else safe while you deal with the threat. It may seem like an easy point to work out but it is still worth putting some thought into where you want to locate your safe. To start with, it makes sense to fix it to the wall or floor, so that it can’t simply be lifted up and taken away by an intruder. This means that you should spend some time finding the ideal spot before securing it. Clearly, you will want it to be easily reachable from your bed. There is simply no point in having it so far away that it takes you valuable seconds to reach it. Some people like to put their bedside gun safe under the bed but could you reach it easily under there in the middle of the night? Alternatively, you might want to fix it to the wall next to the bed for ease of use. You might also want to put your safe inside a bedside drawer, although you will want to be careful to always have good access to it if you do this. Check out how to install this awesome bedside gun safe! 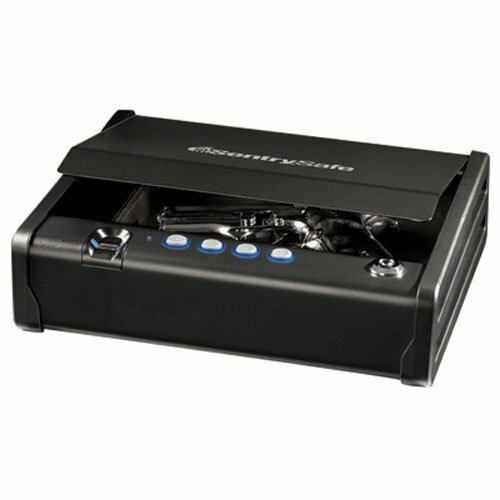 There are some terrific bedside gun safes around and the following are a few of the best choices right now. This popular gun safe fits snugly inside a bedside drawer but is still big enough to contain most handgun types. It has an electronic lock that can be easily re-programmed with new access codes when needed. Anyone who incorrectly types in the code 3 times in a row gets timed out for a period. This model was one of several that previously had issues relating to people being able to break in using just a paperclip. The manufacturer advises that this problem has now been resolved. Another solid choice, this model has received generally positive reviews from online buyers. It features a quick access digital keypad and has a drop down drawer that allows the firearm inside to be taken out speedily. There are a number of mounting options, while the foam lined interior keeps the handguns inside well protected. A back-up key is included as well. 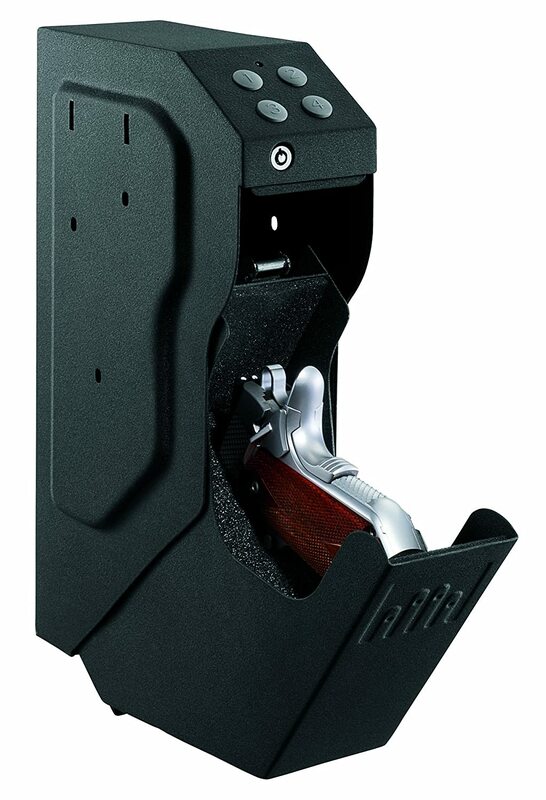 The benefits of biometric access for a bedside gun safe means that this is another very good option. You can program it to recognize your fingerprint as well as an entry code, for added security. This is a solid and reliable model that uses the latest technology to give you a great deal of peace of mind.